Staples' Hannah Debalsi crosses the finish line for first place in the girls cross country meet at Tarrywile Park in Danbury on Wednesday, Sept. 19, 2012. Her impact was immediate with races won and records broken. Still just a sophomore, Staples High's Hannah DeBalsi is determined to deliver a grand encore this fall. DeBalsi established herself as a star on the cross country circuit in 2012, rising among the ranks of the region's top runners. 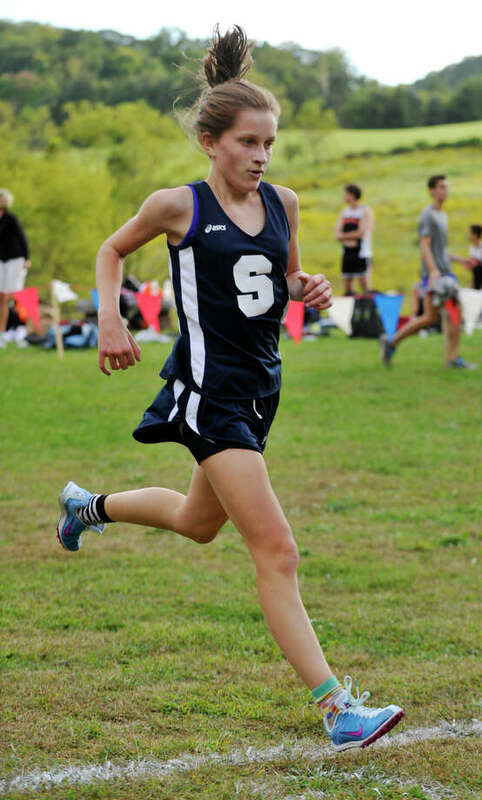 She took third at the FCIACs, second at the LL state championships, 16th at the State Open and concluded her stellar season with an 11th-place finish at New Englands. There's reason to believe that she can improve on those performances. DeBalsi was even better last winter during indoor track, capturing the two-mile title at New Englands in 10:39.43 -- the fourth-fastest time in the nation. "We haven't really seen how fast she can go yet," Staples girls coach Amanda Parrish said of DeBalsi. DeBalsi has a long list of goals set for himself this fall, beginning with individual and team titles. She's the top returnee for a team that has its sights set on a collection of accomplishments. "I'm hoping to go to Nationals for cross country," she said Tuesday following practice. "I didn't do the qualifier last year." Staples returns junior Erica Hefnawy -- 30th at the LL state championship in 2012 -- along with a pack of other fast runners. Senior Tyler Scanlin is joining the team for the first time after placing third in the distance medley with DeBalsi, Hefnawy and senior Emily Troelstra at the Nationals for outdoor track last June. The Wreckers also expect contributions from senior Caroline Koenig, junior Elizabeth French, sophomores Erin Munley (a field hockey player at Staples last fall), Katherine Smith and Angie Parmar, as well as freshman Susie Miller. Koenig, an all-state runner in 2011, missed all of last season with compound open fractures of the tibia and fibula in her leg after she was struck by a car during a training run in Aug. 2012. The Wreckers went on to finish eighth in the conference and ninth in LL states. "I'm hoping that we're in contention for both the FCIAC and the State Open title," said Parrish, who is in her eighth year coaching, including her fourth at Staples. "I'd love to go to New Englands. I think it's a pretty realistic goal. We didn't lose any of our top five (runners) from last year in cross country." Parrish said that Miller has been a pleasant surprise during preseason workouts. The freshman finished fourth during team time trials on Tuesday. "She's run at Junior Olympics and has been successful already as a middle schooler," the coach added. Parrish believes that DeBalsi's immediate success last year has inspired other young runners. "Because of all the success Hannah had, it's established a culture where freshmen can be on varsity and can really make a difference," Parrish said. Staples' boys cross country team faces perhaps the greatest void of any squad at the school this fall. The Wreckers graduated All-American Henry Wynne, who won every race he competed in as a senior last fall. His illustrious season included FCIAC, Class LL state, State Open and New England individual titles. In addition to Wynne, the Wreckers bid adieu to five other seniors, leaving plenty of open spots on varsity. But longtime boys coach Laddie Lawrence doesn't see 2013 as a rebuilding year. "One would think we'd be in a rebuilding year with the number of guys that we graduated, but I think we're going to be better than that," said Lawrence, now in his 42nd year at the helm. "A lot of the kids had a great summer of running." Staples returns plenty of experience led by senior captains Peter Elkind (second-team all-FCIAC in 2012) and Will McDonald. Other returning seniors include Tyler Marks, Griffin Stein, Lazaro Alvarado and Ryan Bukovsky. Lawrence realizes that the Wreckers will have significant work to do to make up for the departures. "We started every meet we were in (last season) with one point with Henry. We're not going to have that this year," the coach said. "It's going to be a little tougher." In 2012, Staples finished second in the conference, ninth at the LL states, fifth at the State Open and ninth at New Englands. The Wreckers return a deep junior class headed by Oliver Hickson, who finished 14th at FCIACs last year. He'll be joined by Jake Atlas, Jake Berman, Patrick Lindwall, Scott Pecoriello, Luis Cruz and Daniel Landy. Campbell Marsh is a returning sophomore, while senior Victor Kolbin and sophomore Chase Gornbein are both newcomers. Lawrence expects the Wreckers to improve early in the season once they start racing and running different workouts. "Times usually drop considerably, especially if they've got a good base. If they don't have a good base, then we're in trouble," he said.